When I grew up, the school year started after Labor Day and ended before Memorial Day. As a result, I always, to this day, think of back to school after Labor Day is over. My favorite thing about back to school was school supplies. How I loved shopping for them! In elementary school, you always had to find a pencil case. I had a roll-top pencil case like this several times, and loved it. This was right up there with Crayola crayons as an early school supply memory for me. How about you? What school supplies did you love as a child? I'd love to hear from you in the comments, below. Oh I love it!! I'm all about retro things!! I had one just like this too! 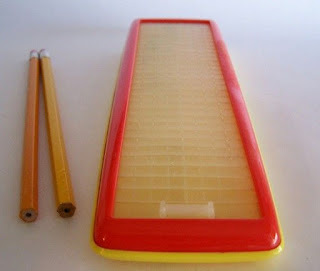 I miss the pencil boxes! I loved my trapper keeper. We also used to trade stickers and cards in school. Even these aren't really supplies, the still always remind me of back to school and fall. Thanks for the visits and comments. I enjoyed reading your retro memories. I loved to shop for school supplies as a child/teen & I still do now. Many of my friends were focused on back to school clothes, but for me it was all about the school supplies. The right pencil case was SO important! And coloured pencils to go in it. And pens & pencils with never been used erasers. Today I always shop the sales after school has started & restock my home office with notebooks, markers, pens of all kinds & much more. And still the pencil case. I have a whole collection of them as they are handy for storing much more than pencils!